After coming off a winning season, which is huge for their program, the Fordham Rams are looking to build on 2015-2016 successes. In his first season as head coach, Jeff Neubauer proved that he has what it takes to coach in the Atlantic 10. Upon being hired, he mentioned how there would be no lengthy rebuild, and the team would essentially have an instant bounce back as the season progressed. After winning 9 of 11 of their non-conference game, the Rams clearly found a winning formula. Major contributions from Seniors Mandell Thomas and Ryan Rhoomes along with A-10 Rookie of the Year Joseph Chartouny thrusted them into their first postseason game since 1992. Despite losing two of their best players to graduation, the Rams look to exceed expectations for a second straight year. Unfortunately, the Rams lost several players this season to graduation and transferring. However, no losses were bigger than seniors Mandell Thomas and Ryan Rhoomes. The two captains took charge and propelled the team further than where they had been in years past. Thomas facilitated the offense while Rhoomes grabbed rebounds and scored valuable buckets in the paint. Together they were responsible for more than half of the Rams’ offensive production. Their contributions will be greatly missed. Fordham also lost guard Jon Severe to transfer. The Junior, who averaged nearly 23 PPG his Freshman year struggled in his two years following. His 6th man spark will be missed in the Rose Hill Gymnasium this year. Despite a slow start to recruiting, the Rams have assembled a very strong group of newcomers. Several key transfers provide instant production while the incoming freshmen provide the team with a very bright future. With all the new talent migrating to the Bronx, nobody will provide more than graduate transfer Javontae Hawkins. Hawkins, a 6-5 guard, will most certainly be an instant impact player this season. As a transfer from Eastern Kentucky, Hawkins is already familiar with Jeff Neubauer’s system, as he played for him during his time at Eastern Kentucky. Averaging 17 PPG and 50% from the field, he should ease the loss of two major scoring pieces in Rhoomes and Thomas. The Rams also landed junior college (JUCO) players Will Tavares, Perris Hicks, and Prokop Slanina who will join the team as Juniors. Tavares, a 6-6 guard, should see major time this season as the Rams look to replace their lost guards. As the leading scorer of his JUCO team, expect to see similar success this coming year potentially in a 6th man or even starting role. Hicks, a 6-1 guard, will also provide the team with veteran depth coming off the bench as he starts the season rehabbing a minor foot injury. However, look for him to be an impact player when back at 100% as he averaged a cool 17 PPG at his previous school. Slanina, a 6-10 big man from the Czech Republic should also see good time this season as the team looks to replace former center Ryan Rhoomes. After seeing how FU’s coaching staff evolved Ryan Rhoomes’ game in just one year makes it exciting to think about how much potential development Slanina has moving forward during his time at Fordham. Given that the Rams have produced the last two A-10 ROY’s it’s only fair to assume that freshmen will yet again serve a valuable role this season. Chuba Ohams was the biggest get of the 2016 recruiting class. The 6-8 Bronx native chose Fordham over high major teams including DePaul, Rutgers, Providence, and A-10 rival VCU. Averaging 21 PPG his senior year, Ohams should help contribute to Fordham’s scoring efforts this season. Very late in the recruiting season, Ali Ton, newly hired assistant coach, added Turkish players Sinan Saglam and Cavit Havsa to the 2016 recruiting class. Ton, who is regarded as the best international recruiter in all of the land, should build upon Fordham’s success with international players. Considering Ton’s track record with international talent (See UC Irvine’s Mamadou N’Diaye) it should be interesting to see how his recruits play a role in the program moving forward. For the time being, it remains to be seen what type of roles Saglam and Havsa will have this season. Despite losing two of their best players, the Fordham Rams will return several great players. To start, 2016 Atlantic 10 Rookie of the Year Joseph Chartouny will be back running the reins. After a great Freshman campaign, he looks to build on his successes. The 6-3 guard averaged 11.3 PPG, as well as 5 rebounds a game. He also led the Rams in steals and recorded what seemed like 4 per game in the transition. He does it all for FU. He runs the offense, rebounds like a forward, shares the ball, and plays hard D. Expect this recently named Pre-season Third Team All Atlantic 10 guard to make waves this season. Other notable returnees include huge role players Antwoine Anderson, Christian Sengfelder, and Nemanja Zarkovic. These veterans all saw big minutes last year and contributed immensely to last season’s success. Look for Anderson to fill the shoes of fellow Rochesterian Mandell Thomas. His game has come a long way since first arriving at Fordham, and this summer’s addition of a better jump shot should only make him a more dangerous weapon. He has all the skills to be a top guard in the A-10, if not already the most athletic. Did you see some of those dunks last season? An unbelievable talent. Christian Sengfelder also looks to be significantly better this year. As a Junior, his role should be even bigger. He looks to have slimmed down and gotten stronger for the upcoming season. His ability to shoot for a forward his size is a huge bonus for the Rams. It seems as if they have no shortage of big guys who can hit from behind the arch (Sengfelder, Prokop, Pekarek, Chuba). Despite not having a big impact on paper, Nemanja Zarkovic is another role player that will pay huge dividends for the Rams. Whether it be taking a charge in transition or hitting a three from the top of the key, his efforts will not go unnoticed. Anyone who watched this team play last year knows just how high Neubauer is on him, so expect similar things this year. Other important returnees include Jesse Bunting and David Pekarek. While being held back due to lack of minutes, these guys showed huge signs of promise at points throughout the season. As they transition into their sophomore year, their game should only get better. If all of the returnees play to the highest of their abilities, the Atlantic 10 is going to be in for a big surprise. Worst case scenario for these players is that they remain how they were last year, which is still great. Fordham’s depth should not be overlooked. After heavy criticism last season, the Rams yet again play one of the easiest out of conference schedules in all of college basketball. Outsiders of the program pointed to their out of conference schedule as justification for why the Rams did so well last year. However, the Rams proved that they are a force in the A-10 after big wins over UMass (home and away), Davidson, URI and a close OT loss to A-10 Champs, The St. Bonaventure Bonnies. This season they look to repeat their OOC victory, including rematches of UT-Arlington, Fairleigh Dickinson, Manhattan, St. John’s, CCSU. Of those games the Rams only loss came in last season’s opener at UT-Arlington. Considering the outcome of those matches last season, they all seem like winnable games. In other OOC games they matchup against @East Tenn. St., NYIT, Saint Peter’s, Lipscomb, Sacred Heart, @Harvard, and Rutgers. In Atlantic 10 play, the Rams play some key road games against A-10 studs. Their toughest matchups include @Richmond, @Davidson, @URI, and @La Salle. As we saw last year, every game is winnable at the Rose Hill Gymnasium, regardless of opponent. Some of their best home games include games versus St. Bonaventure, VCU, Davidson, and Dayton. Expect more of what we saw last year: early success and a tough Atlantic 10 slate. Entering the 2016-17 season, many have Fordham as a bottom feeder of the A-10. However, this team is back and better than last year. Expect big things from this deep, talented team. Jeff Neubauer has proven that his team can compete with the best of the talent that the Atlantic 10 has to offer. In his second year, I expect to see the team one up their success from last year and take another step up. The bar keeps getting higher and higher for the Fordham Rams, and it won’t be long before they stop being overlooked. 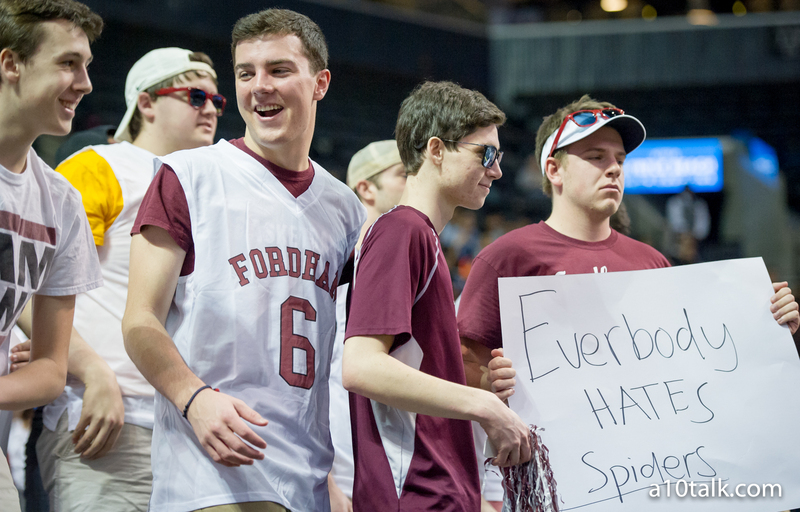 Until then, the team must prove what Fordham fans already know. Follow us on Twitter, like us on Facebook, and check out our forum for more Fordham content. Not sure which schedule you’re looking at but the Rams don’t play St. Bonaventure at home. The teams face each other once this season at a neutral court in Rochester (essentially a bonnies home game). Sorry about that Joe. My mistake.